Windows Presentation Foundation (WPF) data binding provides a simple and consistent way for applications to present and interact with data. Elements can be bound to data from a variety of data sources in the form of common language runtime (CLR) objects and XML. ContentControls such as Button and ItemsControls such as ListBox and ListView have built-in functionality to enable flexible styling of single data items or collections of data items. Sort, filter, and group views can be generated on top of the data. The data binding functionality in WPF has several advantages over traditional models, including a broad range of properties that inherently support data binding, flexible UI representation of data, and clean separation of business logic from UI. This topic first discusses concepts fundamental to WPF data binding and then goes into the usage of the Binding class and other features of data binding. Data binding is the process that establishes a connection between the application UI and business logic. If the binding has the correct settings and the data provides the proper notifications, then, when the data changes its value, the elements that are bound to the data reflect changes automatically. Data binding can also mean that if an outer representation of the data in an element changes, then the underlying data can be automatically updated to reflect the change. For example, if the user edits the value in a TextBox element, the underlying data value is automatically updated to reflect that change. A typical use of data binding is to place server or local configuration data into forms or other UI controls. In WPF, this concept is expanded to include the binding of a broad range of properties to a variety of data sources. In WPF, dependency properties of elements can be bound to CLR objects (including ADO.NET objects or objects associated with Web Services and Web properties) and XML data. The content of the ListBox is bound to a collection of AuctionItem objects. An AuctionItem object has properties such as Description, StartPrice, StartDate, Category, SpecialFeatures, etc. The data (AuctionItem objects) displayed in the ListBox is templated so that the description and the current price are shown for each item. This is done using a DataTemplate. In addition, the appearance of each item depends on the SpecialFeatures value of the AuctionItem being displayed. If the SpecialFeatures value of the AuctionItem is Color, the item has a blue border. If the value is Highlight, the item has an orange border and a star. The Data Templating section provides information about data templating. The user can group, filter, or sort the data using the CheckBoxes provided. In the image above, the "Group by category" and "Sort by category and date" CheckBoxes are selected. You may have noticed that the data is grouped based on the category of the product, and the category name is in alphabetical order. It is difficult to notice from the image but the items are also sorted by the start date within each category. This is done using a collection view. The Binding to Collections section discusses collection views. When the user selects an item, the ContentControl displays the details of the selected item. This is called the Master-Detail scenario. The Master-Detail Scenario section provides information about this type of binding scenario. The type of the StartDate property is DateTime, which returns a date that includes the time to the millisecond. In this application, a custom converter has been used so that a shorter date string is displayed. The Data Conversion section provides information about converters. The user can edit the fields in the form, preview the product listing using the short preview and the more detailed preview panes, and then click submit to add the new product listing. Any existing grouping, filtering and sorting functionalities will apply to the new entry. In this particular case, the item entered in the above image will be displayed as the second item within the Computer category. Not shown in this image is the validation logic provided in the Start Date TextBox. If the user enters an invalid date (invalid formatting or a past date), the user will be notified with a ToolTip and a red exclamation point next to the TextBox. The Data Validation section discusses how to create validation logic. Before going into the different features of data binding outlined above, we will first discuss in the next section the fundamental concepts that are critical to understanding WPF data binding. Note that to detect source changes (applicable to OneWay and TwoWay bindings), the source must implement a suitable property change notification mechanism such as INotifyPropertyChanged. See Implement Property Change Notification for an example of an INotifyPropertyChanged implementation. For an example, see Control When the TextBox Text Updates the Source. To recapitulate some of the concepts discussed in the previous sections, you establish a binding using the Binding object, and each binding usually has four components: binding target, target property, binding source, and a path to the source value to use. This section discusses how to set up a binding. Consider the following example, in which the binding source object is a class named MyData that is defined in the SDKSample namespace. For demonstration purposes, MyData class has a string property named ColorName, of which the value is set to "Red". Thus, this example generates a button with a red background. For more details on the binding declaration syntax and for examples of how to set up a binding in code, see Binding Declarations Overview. If we apply this example to our basic diagram, the resulting figure looks like the following. This is a OneWay binding because the Background property supports OneWay binding by default. You may wonder why this works even though the ColorName property is of type string while the Background property is of type Brush. This is default type conversion at work and is discussed in the Data Conversion section. Notice that in the previous example, the binding source is specified by setting the DataContext property on the DockPanel element. The Button then inherits the DataContext value from the DockPanel, which is its parent element. To reiterate, the binding source object is one of the four necessary components of a binding. Therefore, without the binding source object being specified, the binding would do nothing. Other than setting the DataContext property on an element directly, inheriting the DataContext value from an ancestor (such as the button in the first example), and explicitly specifying the binding source by setting the Source property on the Binding (such as the button the last example), you can also use the ElementName property or the RelativeSource property to specify the binding source. The ElementName property is useful when you are binding to other elements in your application, such as when you are using a slider to adjust the width of a button. The RelativeSource property is useful when the binding is specified in a ControlTemplate or a Style. For more information, see Specify the Binding Source. If your binding source is an object, you use the Path property to specify the value to use for your binding. If you are binding to XML data, you use the XPath property to specify the value. In some cases, it may be applicable to use the Path property even when your data is XML. For example, if you want to access the Name property of a returned XmlNode (as a result of an XPath query), you should use the Path property in addition to the XPath property. For syntax information and examples, see the Path and XPath property pages. Other than binding to a collection, this scenario is also useful when you want to bind to an entire object instead of just a single property of an object. For example, if your source object is of type string and you simply want to bind to the string itself. Another common scenario is when you want to bind an element to an object with several properties. Note that you may need to apply custom logic so that the data is meaningful to your bound target property. The custom logic may be in the form of a custom converter (if default type conversion does not exist). See Data Conversion for information about converters. Before getting into other features and usages of data binding, it would be useful to introduce the BindingExpression class. As you have seen in previous sections, the Binding class is the high-level class for the declaration of a binding; the Binding class provides many properties that allow you to specify the characteristics of a binding. A related class, BindingExpression, is the underlying object that maintains the connection between the source and the target. A binding contains all the information that can be shared across several binding expressions. A BindingExpression is an instance expression that cannot be shared and contains all the instance information of the Binding. For example, consider the following, where myDataObject is an instance of MyData class, myBinding is the source Binding object, and MyData class is a defined class that contains a string property named MyDataProperty. This example binds the text content of mytext, an instance of TextBlock, to MyDataProperty. You can use the same myBinding object to create other bindings. For example, you may use myBinding object to bind the text content of a check box to MyDataProperty. In that scenario, there will be two instances of BindingExpression sharing the myBinding object. In the previous example, the button is red because its Background property is bound to a string property with the value "Red". This works because a type converter is present on the Brush type to convert the string value to a Brush. The IValueConverter reference page provides more information. To reiterate, default conversions may be available because of type converters that are present in the type being bound to. This behavior will depend on which type converters are available in the target. If in doubt, create your own converter. Your data should be displayed differently, depending on culture. For instance, you might want to implement a currency converter or a calendar date/time converter based on the values or standards used in a particular culture. The data being used is not necessarily intended to change the text value of a property, but is instead intended to change some other value, such as the source for an image, or the color or style of the display text. Converters can be used in this instance by converting the binding of a property that might not seem to be appropriate, such as binding a text field to the Background property of a table cell. More than one control or to multiple properties of controls are bound to the same data. In this case, the primary binding might just display the text, whereas other bindings handle specific display issues but still use the same binding as source information. So far we have not yet discussed MultiBinding, where a target property has a collection of bindings. In the case of a MultiBinding, you use a custom IMultiValueConverter to produce a final value from the values of the bindings. For example, color may be computed from red, blue, and green values, which can be values from the same or different binding source objects. See the MultiBinding class page for examples and information. A binding source object can be treated either as a single object of which the properties contain data or as a data collection of polymorphic objects that are often grouped together (such as the result of a query to a database). So far we've only discussed binding to single objects, however, binding to a data collection is a common scenario. For example, a common scenario is to use an ItemsControl such as a ListBox, ListView, or TreeView to display a data collection, such as in the application shown in the What Is Data Binding? section. As shown in this diagram, to bind an ItemsControl to a collection object, ItemsSource property is the property to use. You can think of ItemsSource property as the content of the ItemsControl. Note that the binding is OneWay because the ItemsSource property supports OneWay binding by default. You can enumerate over any collection that implements the IEnumerable interface. However, to set up dynamic bindings so that insertions or deletions in the collection update the UI automatically, the collection must implement the INotifyCollectionChanged interface. This interface exposes an event that should be raised whenever the underlying collection changes. WPF provides the ObservableCollection<T> class, which is a built-in implementation of a data collection that exposes the INotifyCollectionChanged interface. Note that to fully support transferring data values from source objects to targets, each object in your collection that supports bindable properties must also implement the INotifyPropertyChanged interface. For more information, see Binding Sources Overview. Before implementing your own collection, consider using ObservableCollection<T> or one of the existing collection classes, such as List<T>, Collection<T>, and BindingList<T>, among many others. If you have an advanced scenario and want to implement your own collection, consider using IList, which provides a non-generic collection of objects that can be individually accessed by index and thus the best performance. Once your ItemsControl is bound to a data collection, you may want to sort, filter, or group the data. To do that, you use collection views, which are classes that implement the ICollectionView interface. A collection view is a layer on top of a binding source collection that allows you to navigate and display the source collection based on sort, filter, and group queries, without having to change the underlying source collection itself. A collection view also maintains a pointer to the current item in the collection. If the source collection implements the INotifyCollectionChanged interface, the changes raised by the CollectionChanged event are propagated to the views. Because views do not change the underlying source collections, each source collection can have multiple views associated with it. For example, you may have a collection of Task objects. With the use of views, you can display that same data in different ways. For example, on the left side of your page you may want to show tasks sorted by priority, and on the right side, grouped by area. One way to create and use a view is to instantiate the view object directly and then use it as the binding source. For example, consider the Data Binding Demo application shown in the What Is Data Binding? section. The application is implemented such that the ListBox binds to a view over the data collection instead of the data collection directly. The following example is extracted from the Data Binding Demo application. The CollectionViewSource class is the Extensible Application Markup Language (XAML) proxy of a class that inherits from CollectionView. In this particular example, the Source of the view is bound to the AuctionItems collection (of type ObservableCollection<T>) of the current application object. To create another view for the same collection, you can create another CollectionViewSource instance and give it a different x:Key name. The following table shows which view data types are created as the default collection view or by CollectionViewSource based on the source collection type. IEnumerable An internal type based on CollectionView Cannot group items. Specifying a collection view as a binding source is one way to create and use a collection view. WPF also creates a default collection view for every collection used as a binding source. If you bind directly to a collection, WPF binds to its default view. Note that this default view is shared by all bindings to the same collection, so a change made to a default view by one bound control or code (such as sorting or a change to the current item pointer, discussed later) is reflected in all other bindings to the same collection. To get the default view, you use the GetDefaultView method. For an example, see Get the Default View of a Data Collection. To improve performance, collection views for ADO.NET DataTable or DataView objects delegate sorting and filtering to the DataView. This causes sorting and filtering to be shared across all collection views of the data source. To enable each collection view to sort and filter independently, initialize each collection view with its own DataView object. As mentioned before, views can apply a sort order to a collection. As it exists in the underlying collection, your data may or may not have a relevant, inherent order. The view over the collection allows you to impose an order, or change the default order, based on comparison criteria that you supply. Because it is a client-based view of the data, a common scenario is that the user might want to sort columns of tabular data per the value that the column corresponds to. Using views, this user-driven sort can be applied, again without making any changes to the underlying collection or even having to requery for the collection content. For an example, see Sort a GridView Column When a Header Is Clicked. If you are using one of the CollectionView classes directly instead of CollectionViewSource, you would use the Filter property to specify a callback. For an example, see Filter Data in a View. Except for the internal class that views an IEnumerable collection, all collection views support the functionality of grouping, which allows the user to partition the collection in the collection view into logical groups. The groups can be explicit, where the user supplies a list of groups, or implicit, where the groups are generated dynamically depending on the data. 'This groups by property "Category"
For another grouping example, see Group Items in a ListView That Implements a GridView. Views also support the notion of a current item. You can navigate through the objects in a collection view. As you navigate, you are moving an item pointer that allows you to retrieve the object that exists at that particular location in the collection. For an example, see Navigate Through the Objects in a Data CollectionView. 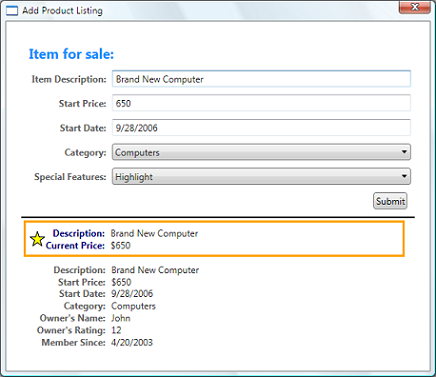 Because WPF binds to a collection only by using a view (either a view you specify, or the collection's default view), all bindings to collections have a current item pointer. When binding to a view, the slash ("/") character in a Path value designates the current item of the view. In the following example, the data context is a collection view. The first line binds to the collection. The second line binds to the current item in the collection. 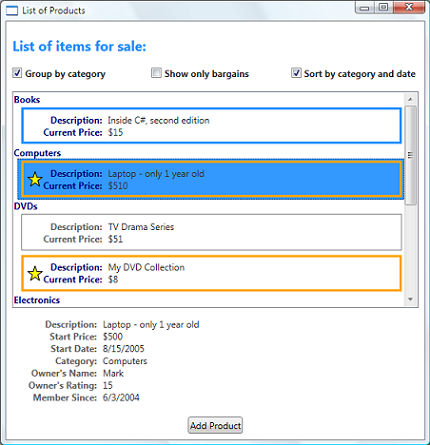 The third line binds to the Description property of the current item in the collection. The slash and property syntax can also be stacked to traverse a hierarchy of collections. The following example binds to the current item of a collection named Offices, which is a property of the current item of the source collection. The current item pointer can be affected by any sorting or filtering that is applied to the collection. Sorting preserves the current item pointer on the last item selected, but the collection view is now restructured around it. (Perhaps the selected item was at the beginning of the list before, but now the selected item might be somewhere in the middle.) Filtering preserves the selected item if that selection remains in view after the filtering. Otherwise, the current item pointer is set to the first item of the filtered collection view. The notion of a current item is useful not only for navigation of items in a collection, but also for the master-detail binding scenario. Consider the application UI in the What Is Data Binding? section again. In that application, the selection within the ListBox determines the content shown in the ContentControl. To put it in another way, when a ListBox item is selected, the ContentControl shows the details of the selected item. Notice that both of the controls are bound to the same source, the listingDataView static resource (see the definition of this resource in the How to Create a View section). This works because when a singleton object (the ContentControl in this case) is bound to a collection view, it automatically binds to the CurrentItem of the view. Note that CollectionViewSource objects automatically synchronize currency and selection. If your list control is not bound to a CollectionViewSource object as in this example, then you would need to set its IsSynchronizedWithCurrentItem property to true for this to work. For other examples, see Bind to a Collection and Display Information Based on Selection and Use the Master-Detail Pattern with Hierarchical Data. You may have noticed that the above example uses a template. In fact, the data would not be displayed the way we wish without the use of templates (the one explicitly used by the ContentControl and the one implicitly used by the ListBox). We now turn to data templating in the next section. 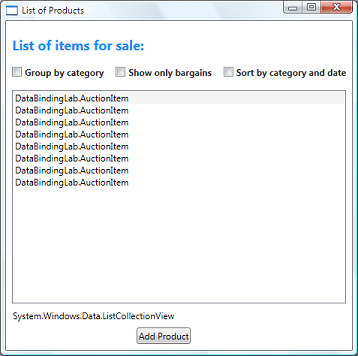 As shown in the example in the previous section, both the ListBox control and the ContentControl are bound to the entire collection object (or more specifically, the view over the collection object) of AuctionItems. Without specific instructions of how to display the data collection, the ListBox is displaying a string representation of each object in the underlying collection and the ContentControl is displaying a string representation of the object it is bound to. With the use of those two DataTemplates, the resulting UI is the one shown in the What Is Data Binding? section. As you can see from that screenshot, in addition to letting you place data in your controls, DataTemplates allow you to define compelling visuals for your data. For example, DataTriggers are used in the above DataTemplate so that AuctionItems with SpecialFeatures value of HighLight would be displayed with an orange border and a star. For more information about data templates, see the Data Templating Overview. Most applications that take user input need to have validation logic to ensure that the user has entered the expected information. The validation checks can be based on type, range, format, or other application-specific requirements. This section discusses how data validation works in the WPF. The WPF data binding model allows you to associate ValidationRules with your Binding object. For example, the following example binds a TextBox to a property named StartPrice and adds a ExceptionValidationRule object to the Binding.ValidationRules property. A ExceptionValidationRule checks for exceptions thrown during the update of the binding source property. In the previous example, StartPrice is of type integer. When the user enters a value that cannot be converted to an integer, an exception is thrown, causing the binding to be marked as invalid. An alternative syntax to setting the ExceptionValidationRule explicitly is to set the ValidatesOnExceptions property to true on your Binding or MultiBinding object. A DataErrorValidationRule object checks for errors that are raised by objects that implement the IDataErrorInfo interface. For an example of using this validation rule, see DataErrorValidationRule. An alternative syntax to setting the DataErrorValidationRule explicitly is to set the ValidatesOnDataErrors property to true on your Binding or MultiBinding object. Note that because the UpdateSourceTrigger value is PropertyChanged, the binding engine updates the source value on every keystroke, which means it also checks every rule in the ValidationRules collection on every keystroke. We discuss this further in the Validation Process section. The AdornedElementPlaceholder element specifies where the control being adorned should be placed. In addition, you may also use a ToolTip to display the error message. Both the StartDateEntryForm and the StartPriceEntryFormTextBoxes use the style textStyleTextBox, which creates a ToolTip that displays the error message. The following example shows the definition of textStyleTextBox. The attached property HasError is true when one or more of the bindings on the properties of the bound element are in error. For an example of how to provide logic to validate all controls in a dialog box, see the Custom Dialog Boxes section in the Dialog Boxes Overview. Validation usually occurs when the value of a target is transferred to the binding source property. This occurs on TwoWay and OneWayToSource bindings. To reiterate, what causes a source update depends on the value of the UpdateSourceTrigger property, as described in the What Triggers Source Updates section. The following describes the validation process. Note that if a validation error or other type of error occurs at any time during this process, the process is halted. The binding engine checks if there are any custom ValidationRule objects defined whose ValidationStep is set to RawProposedValue for that Binding, in which case it calls the Validate method on each ValidationRule until one of them runs into an error or until all of them pass. The binding engine then calls the converter, if one exists. If the converter succeeds, the binding engine checks if there are any custom ValidationRule objects defined whose ValidationStep is set to ConvertedProposedValue for that Binding, in which case it calls the Validate method on each ValidationRule that has ValidationStep set to ConvertedProposedValue until one of them runs into an error or until all of them pass. The binding engine sets the source property. The binding engine checks if there are any custom ValidationRule objects defined whose ValidationStep is set to UpdatedValue for that Binding, in which case it calls the Validate method on each ValidationRule that has ValidationStep set to UpdatedValue until one of them runs into an error or until all of them pass. If a DataErrorValidationRule is associated with a binding and its ValidationStep is set to the default, UpdatedValue, the DataErrorValidationRule is checked at this point. This is also the point when bindings that have the ValidatesOnDataErrors set to true are checked. The binding engine checks if there are any custom ValidationRule objects defined whose ValidationStep is set to CommittedValue for that Binding, in which case it calls the Validate method on each ValidationRule that has ValidationStep set to CommittedValue until one of them runs into an error or until all of them pass. If a ValidationRule does not pass at any time throughout this process, the binding engine creates a ValidationError object and adds it to the Errors collection of the bound element. Before the binding engine runs the ValidationRule objects at any given step, it removes any ValidationError that was added to the Errors attached property of the bound element during that step. For example, if a ValidationRule whose ValidationStep is set to UpdatedValue failed, the next time the validation process occurs, the binding engine removes that ValidationError immediately before it calls any ValidationRule that has ValidationStep set to UpdatedValue. When Errors is not empty, the HasError attached property of the element is set to true. Also, if the NotifyOnValidationError property of the Binding is set to true, then the binding engine raises the Validation.Error attached event on the element. Also note that a valid value transfer in either direction (target to source or source to target) clears the Errors attached property. If the binding either has an ExceptionValidationRule associated with it, or had the ValidatesOnExceptions property is set to true and an exception is thrown when the binding engine sets the source, the binding engine checks to see if there is a UpdateSourceExceptionFilter. You have the option to use the UpdateSourceExceptionFilter callback to provide a custom handler for handling exceptions. If an UpdateSourceExceptionFilter is not specified on the Binding, the binding engine creates a ValidationError with the exception and adds it to the Errors collection of the bound element. You can set the attached property TraceLevel on a binding-related object to receive information about the status of a specific binding.